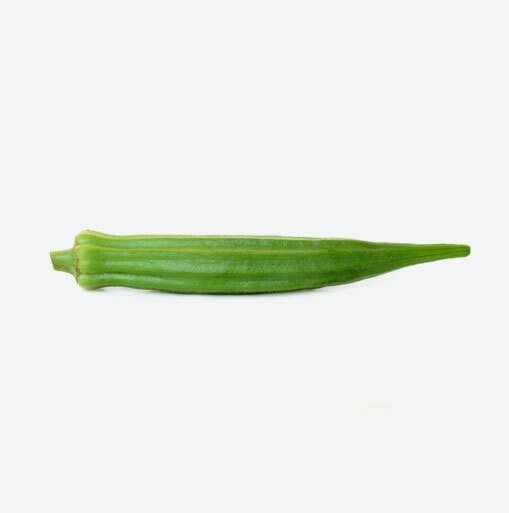 Okra is a tropical herb that belongs to the Mallow family which is related to cotton, hibiscus plants and hollyhocks Mallow family, related to cotton, hibiscus and hollyhock. This herb is cultivated for its edible green seed pods which can be anywhere from 3 to 10 inches in length. The tender, unripe seed pods are used as a vegetable, and have a unique texture and sweet flavour. The pods, when cut, have a mucilaginous juice that is used to thicken stews such as the well known gumbo dish. Okra tastes like a cross between asparagus and eggplant. Okra is low in calories and it is a good source of many nutrients including vitamin B6, vitamin C, fiber, calcium, and folic acid. The nutrients that okra delivers are effective in helping to prevent neural tube defects in developing fetuses. Okra is fat-free and great for individuals who are counting calories. Look for young, tender but firm pods. They should snap easily in half. The best varieties are a rich green colour. Avoid pods that are dull and dry looking, blemished or limp. When you bring okra home, store in a paper bag in the warmest part of your refrigerator, as temperatures below 45 degrees can damage okra. Okra is highly perishable and it needs to be used the same day you purchase it or within 2 days of purchase. Wash okra just before you are ready to use it or it will become slimy. Don’t use aluminum pots when cooking okra as the okra will discolour them. Okra can be used in a variety of dishes. It is delicious if it is sautéed or fried. Young, tender okra can be slice and dipped in egg; breaded with corn meal and fried (this is a favorite Southern U.S dish). Sauté okra with corn kernels, onion and sweet peppers. Okra can also be steamed, baked, pickled, boiled or stewed. Okra can be substituted for eggplant because of its similar flavour.